Tips for installing and winterizing a French drain in the Pittsburgh climate. If you live in the South Hills of Pittsburgh, you’ve probably had an incident with frozen pipes at least once in your life. While many home and business owners tend to think of preparing their interior pipes for the long winter, some may not realize the threat of a frozen exterior French drain. French drains are used to keep water away from your foundation, but if your drain isn’t protected from the freezing temperatures you’re foundation may be at risk. With November temperatures already dropping below freezing in the South Hills, J Bird’s Landscaping is offering several French drain installation and winterization tips before Old Man Winter makes a visit! While the majority of your French drain’s piping system will be buried below the frost line, any of the vertical maintenance spouts and parts of the final drainage system may include some piping that’s left above the frost line. Any piping buried above the frost line should be wrapped in insulation during your French drain installation. This is not ensure freezing doesn’t occur where the pipe may be exposed to freezing ground temps. If you’re looking to learn more about French Drain Installation in your South Hills home, J Bird’s Landscaping can help. ter from passing through the drain, negating the purpose of your French drain. While most French drains run downhill behind a home, this may not work as well in areas prone to freezing. If you’re planning on installing a French drain in your South Hills home, consider installing a dry well at the end of your drainage system. A dry well is a large hole placed below the frost line where water can collect and have enough time to dissipate into the ground before freezing. For additional security, you can install a perforated metal drum inside the dry well to not only help the water seep into the earth, but to prevent any dirt clogging the dry well. For whatever reason, sometimes you can’t add a dry well to your French drain. In this case, you can add a larger pipe at the end of your drainage system to help any ice or build-up easily exit your system. This is called a flare system and is helpful when a dry well isn’t a possibility. A misconception of many is to tie their downspouts into their French drain. This is not a good practice, even in the warmest of climates. Attaching your downspouts to your French drain is not only going to overload your drainage system, but excess gutter leaves and other debris may also freeze and clog up your French drain. Gutters and downspouts should have their own drainage system or a separate French drain for that specific purpose altogether. 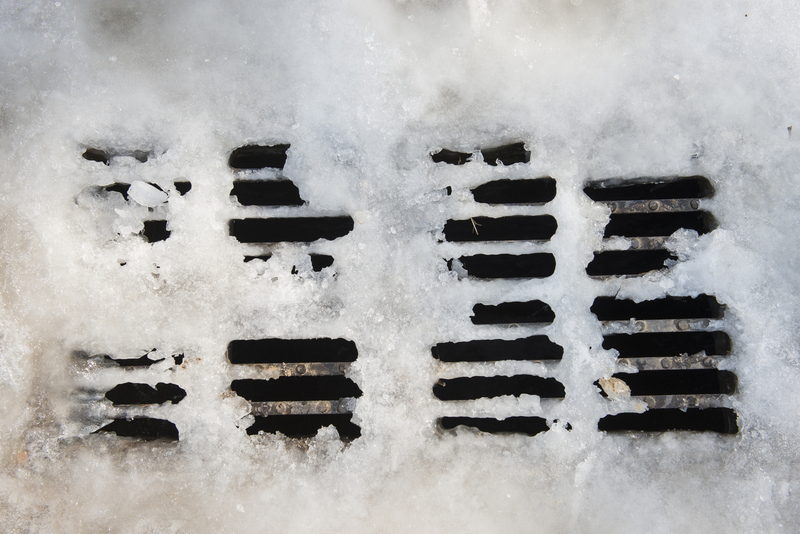 Remember, much like unprotected interior pipes, the freeze and thaw of the season can create cracks in the exterior drain if they’re not winterized or installed properly. French drains typically require little maintenance, but if your experiencing water in your basements or suspect your French drain isn’t working properly, call J Bird’s Landscaping at (412) 224-0639 for all of your South Hills French drain needs!